Comments: At the age of 16 years, Joseph Nicholas Graham enlisted as a Private in Company E, 46th Virginia Infantry, in Scottsville on June 5, 1861. His official military record notes that he was reported sick in November 1862 and promoted to Sergeant on December 26, 1863. On May 7, 1864, the 46th VA Infantry arrived in Petersburg to defend that area from the advancing Army of the Potomac. The movement of the Army of the Potomac to Petersburg was part of Grant's effort to put extreme pressure on a number of the Union Army's strategic objectives throughout southern Virginia. After seven and a half months in South Carolina, the 46th VA Infantry was at last back in Virginia, and it was to be a very violent homecoming. Though the regiment had endured its share of hardship in three years of war, it had yet suffered but few battle casualties. That was about to change. Gone were the endless weeks and months of guard duty, camp life, and being held in reserve. By May 17th, 1864, the 46th was entrenched near Bake-House Creek where it received its first tastes of trench warfare as they became engaged in fierce sharpshooting battles and heavy shellfire with the its Union enemy. June 17, 1864, proved to be the 46th VA Infantry's "Antietam." Never before nor after did it suffer as many deaths and injuries in a 24-hour period as it did on that day. The compiled Service Records for the 46th VA Infantry show that at least 25 had been killed or mortally wounded, 87 wounded, and 19 captured, for a total loss of 131 soldiers. In the previous three days, the regiment had seem more action and suffered more casualties than it had in the three previous years of warfare combined. In the five weeks since its return to Virginia, 51 men of the 46th had been shot dead, 140 were wounded, and 25 captured, for a combined total of 216, or slightly more than one-third of the 46th's soldiers who left South Carolina. The next four months would continue to expose the 46th VA Infantry and other Confederate troops, holding the extreme left of the Petersburg trench line, to daily (and nightly) picket firing and sharpshooting which struck down dozens of the 46th's soldiers. With two men to a hole forward of the trench line, the 46th Infantry regiment's own sharpshooters were posted and relieved every twenty-four hours. The 46th "gave as good as is sent." The 46th VA Infantry was reunited with its colonel when Randolph Harrison, having recovered from his neck wound during a 4-month convalescence, returned to duty on October 27, 1864. His resumption of command, however, lasted but a few hours. As pickets in front of the 46th were being relieved at dusk that same evening, about 100 men from the 148th Pennsylvania dashed across no-man's land with the intention of destroying Davidson's Battery. Mistaken by some as incoming deserters and by others as picket relief, the Yankees made it across without being harmed. By the time the situation finally became clear, Colonel Harrison, who had just walked over to see what was going on, had been grabbed along with three other officers and thirteen men. The Yankees were then driven off with some loss, but Colonel Harrison and the rest of the captured men were not recovered. The 46th VA Infantry was then placed under the command of Captain John H. White. With pleasure I embrace the present opportunity to respond to yours dated the 23 of this month which came to hand today at least yesterday. You cannot imagine how glad I was to hear from you all and hear that you and all the family was well. Those few lines I am glad to say leaves me in tolerable good health and I sincerely hope those few lines may come safe to hand and find you and the family enjoying all the happiness of a kind providence. I have not any news of interest except we had a little bustup last night when about 100 Yankees charged one of our Batteries that had nothing in it except one gun. They got in the battery, but the reason they got to the battery was that our officers kept telling us to stop firing, and the Yankees said stop that it was our own men and we thought that perhaps it was our pickets. But if the privates and non-commissioned officers had of had their own way this Yankee would never of got there. Well, the Yankees they came in and as there was not any of our men for a space of near 100 yards, they had but little opposition. This space was between the 46th and 54th regiments. Steps were soon taken to dislodge them from the works with 3 companies charging them out. I am sorry to say through an oversight both of our colonels were captured and 2 lieutenants also were captured and one private and 2 wounded. The 54th Regt lost more than our regiment. 3 Yankees were killed, and 13 made prisoners. They had to leave the battery. None of our Co. was hurt, but we did not sleep much. I will say it was a bold thing for the Yankees and a disgraceful thing on our side. I am sorry that you did not get my letter in time to send me my coat. I am sorry to hear you have not found your cow. I am like you. I fear you will never find her but live in hopes that you got the last paper I sent direct to Uncle Jo, and I also endorsed it. I got tired of waiting for an answer which I got yesterday, and so I wrote you another letter. a day or so back. I also sent in it $10. You must write me word if you get it. Give my love to Uncle Jo and Aunt Sarah and Bettie and Mollie and Kit and Ellen and all the family and reserve a large portion for yourself. P.S. Write soon. May God bless you and protect you is in my prayers. Joseph Nicholas Graham was captured by the Union Army at Farmville, Virginia, on April 6, 1865. On June 13, 1865, Graham took the oath of allegiance to the U.S. Government at Point Lookout prison camp in St. Mary's County, Maryland. Point Lookout was the largest and one of the worst Union prisoner-of-war camps, established on August 1, 1863. Joseph Nicholas Graham was born on May 4, 1845 near Scottsville in Fluvanna County, VA. He was the son of James S. Graham (b. 1805) and Mary Hix (Harris) Graham (b. 1809), and the brother of Mariah Elizabeth Graham (1849-1942) and Mary K. Graham (b. 1852). After the Civil War, Joseph returned to Fluvanna County, VA (RFD Scottsville, Albemarle County,VA) where he worked as a harness maker and operated his own harness shop in Fluvanna until about 1917. Joseph Nicholas Graham passed away on December 10, 1932, in Fluvanna County. Joseph was under the care of Dr. Percy Harris of Scottsville at the time of his passing. 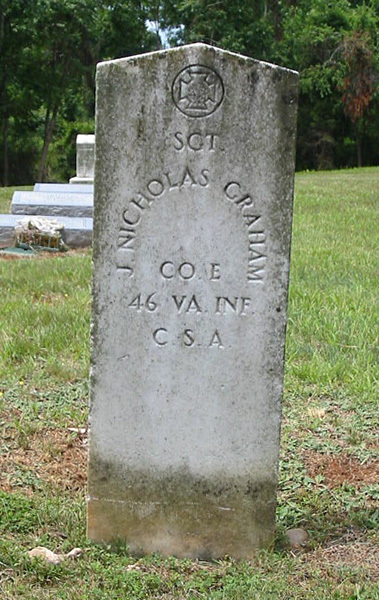 Joseph Nicholas Graham is buried at Scottsville Baptist Church Cemetery in Scottsville, VA.
1) 46th Virginia Infantry by Darrell L. Collins. (Lynchburg, VA: H.E. Howard, Inc., 1992), pp. 52-68, 112. 2) Letter from Jos. N. Graham, dated 28 October 1964. Joseph Nicholas Graham Collection, Scottsville Museum. 3) 1870 U.S. Census, Columbia, Fluvanna, Virginia; Roll: M593_165B, National Archives and Records Administration, Washington, DC. 4) 1900 U.S. Census, Cunningham, Fluvanna, Virginia; Page 8, Enumeration District:0073; Microfilm: 1241708. 5) 1930 U.S. Cemsus, Cunningham, Fluvanna, Virginia; Page 5B, Enumeration District: 0005; Microfilm: 2342177.